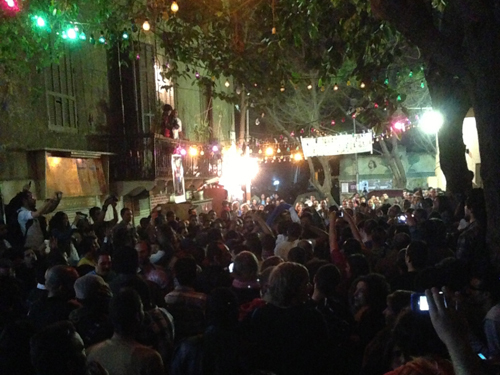 A large group of volunteers created an "alternative solution" to the closing down of Rawabet Theatre as a creative reaction to the lack of free, independent performance spaces for artists in Cairo. Hal Badeel (Alternative Solution) Festival for Arts closed on Wednesday, 17 April after providing many free events from music, theatre and contemporary dance to film, clown and mime performances since 24 March. The festival featured some of the most dynamic and creative artists from Cairo's independent culture community, who frequent Downtown Cairo, and over the past ten years have turned the neighbourhood into a district buzzing with art. 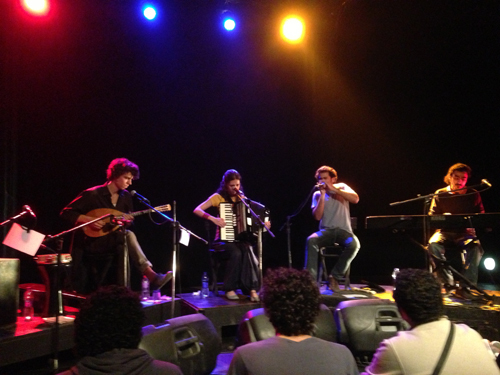 Artists and cultural groups, such asThe Choir Project, Mashrou' El-Mareekh, Maurice Louca, Like Jelly, and Youssra El-Hawary among many others participated in the festival. "I want to thank the organisers of Hal Badeel, who really transformed the neighbourhood for the past few weeks," Youssra El-Hawary said before her performance on the closing night. "The streets around the area were full of life in a completely new way." A month and a half before the festival started, volunteers transformed the donated Factory Space at Townhouse Gallery in Downtown Cairo from an exhibition space to a theatre. With donated equipment and borrowed seating from Rawabet, the crew managed to make The Factory look and feel like Rawabet used to be – a garage with black walls, a stage on the ground and the sound of independent art filling the room. The festival was free of charge and a screen was placed outside the space to share the performances with a wider audience. Hal Badeel is brainchild of Mido Sadek, who is technically responsible for The Factory Space at Townhouse, and Saber El-Sayed, lighting technician who works in several spaces, including Rawabet Theatre. "People would always pass by and ask around where Rawabet Theatre is. One day, as we sat with that same group, we brought up the idea for the festival. Everyone was excited to get on board. These people are the reason this festival became a reality," he explained. "We made sure everyone felt appreciated, by including their names in any public release we make, by giving the volunteers the voice to speak to the media on Hal Badeel's behalf. It was a collective ownership of everyone involved," Sayed said. "Organising the festival was a challenge because we are not really organisers," Sayed said. "However, many people along the way helped us to put this together, from the poster design to translating artist briefs." Most of the participating artists like contemporary dancers Sherine Hegazy, Ahmed El-Gendy and Mirette Mechail and others are friends of Sayed and Sadek. "Even the artists we didn't know, such as Like Jelly and Rami Abadeer, welcomed the idea with open arms, and were willing to participate with no financial reward because they believed in what we were trying to do," Sayed told Ahram Online. The festival, in spite of its success, had a few drawbacks. The timing of the festival coincided with the Downtown Contemporary Arts Festival (D-CAF), which affected the audience of the latter attracting them to Hal Badeel's events. Operating within the same neighbourhood (Downtown Cairo), perhaps in the future, Hal Badeel and D-CAF could coordinate to assure that the audience has an equal opportunity to attend both festivals. Another logistical issue was Hal Badeel's organisers had several performances of different genres set on the same evening. This idea required the stage to be completely reversed for each consecutive performance, and while the technical procedure was executed, the audience was asked to leave the theatre and wait outside until they set up for the next show. Though the procedure sounds quite natural, it was clear on the final night of the festival when the crowd was too large to assure a fluid movement from one place to another within the narrow streets of the neighbourhood. 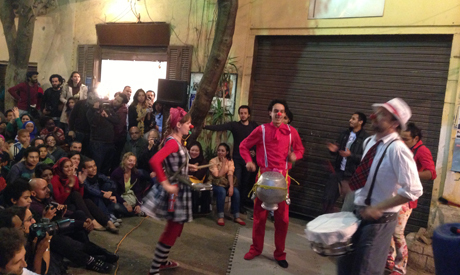 Outa Hamra presented their clown show on the street, and then Karima Mansour's Contemporary Dance School presented their performance inside. There were at least 150 people who were not able to enter, some of which had been there since the start of Outa Hamra's performance. After the dance show, the audience was asked to once again leave the space so they could set up for Youssra El-Hawary and her band. This caused a lot of chaos and frustration for the audience. In the future, these issues could be avoided with better programming that secures performances of similar settings to be grouped in one evening. The clever programming presented great performances, which people enjoyed, making the frustrations worth the effort. The positive energy among the organisers also transcended to the audience as each performance at Hal Badeel felt like a very large meeting with friends and family. The next steps for Hal Badeel will be to see the lessons learned and how it can be replicated even more successfully in other spaces. "For Saber and I, it is really important that this project continues," Sadek said. "Cairo needs more spaces for independent artists to be free to really present what they have to offer," he added. In the next edition of Hal Badeel, they are considering using the apartments of their friends, who have large reception areas to have simultaneous performances for a small audience. They are also considering taking Hal Badeel to governorates outside of Cairo. The group also hopes to secure funding, as the festival was entirely financed out of their own pockets, even though the budget was almost non-existent. They also plan to have training workshops for volunteers and technical managers before the next edition of festivals. "It will remain free for the audience," Sadek said. "The idea is to keep it free of charge, leaving the door open for anyone passing by to check out the events, and gather a larger audience to help with the outreach of independent artists." The festival started as a street festival and ended asa street Shaabi music party, with people jumping around to the electronic and oriental beats until midnight. Hal Badeel is a living, breathing proof that collective efforts and belief in a cause will transform into a reality.